Any qualified Orlando, Fl. insurance broker will tell you that the first step to selecting proper insurance coverage is to select an efficient insurance broker. While doing some researching of your own is always a good idea, your insurance broker should be experienced and attentive enough to take the time to not only explain various insurance services to you, but also go above and beyond to make sure that you have all the insurance coverage you need � without paying for services that do not apply to you. If you live in or around Orlando, Fl., Aggressive Insurance Inc is the right choice for you. Our Orlando, Fl. insurance brokers have years of experience managing both small and big insurance policies, both for individuals and business owners. We are experts when it comes to Auto Insurance, Home Insurance and General Liability. The key to our success is that we always take the time necessary to listen to your unique situation and needs. Any good insurance broker will agree that this is the second most important step in choosing proper insurance coverage. We will ask you a lot of questions pertaining to your health, your career, your budget and any other factor that will affect your insurance coverage. This information is vital for us to be able to advise you adequately and create a custom insurance plan or package that works for you or your business. 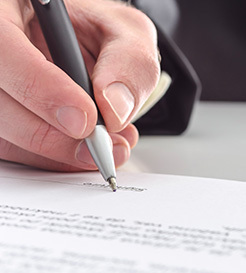 Make sure you fully understand every component of your insurance policy before you sign anything. Read your insurance policy carefully and ask your insurance broker to explain any detail you are unsure of, and how it might affect your coverage in any given situation. When deciding how much insurance coverage to get, you should also think ahead. Are you planning to start a family in the near future? Have you been toying with the idea of getting an additional vehicle, or do you have plans to renovate your home? All of these questions should be considered carefully and discussed with your insurance broker, who should then review package options with you, and explain when and how your insurance policy can be modified to adapt to the changes in your health. Choosing the proper insurance coverage should not be a hard and frustrating process. With the right insurance broker and a bit of your time, it should allow you to quickly and efficiently cover all of your insurance needs without breaking the bank. If you are in need of an experienced and qualified insurance broker and live in the Orlando, Fl. area, contact Aggressive Insurance Inc. We will gladly schedule a free consultation and answer all of your insurance related questions.